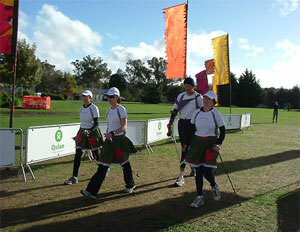 The team from Grafton Consulting as they finish the 100km Oxfam Challenge. From left: Lisa Rae, Judy Mewburn, Paul Stevenson and Lizzie Jepson. Note the 'Nordic' dress they wore to celebrate their finish! Click your fingers ... now click them again. Three seconds has passed between clicks and in this time, somewhere in the world, a child has died from poverty or neglect. The humanitarian organization, Oxfam, furnished these statistics, forming the basis for the World Series of 100 km Trailblazer Challenges. Designed to raise awareness and funds to overcome child poverty, a four-person team must all complete th e 100-kilometre walk within 36 hours. The event was held in Taupo during early April. A team of colleagues from Grafton Consulting Group, in Auckland, were moved by the appalling statistics on the death rate for children and decided to enter the challenge. Three of the team had never participated in an endurance event before, so this challenge was one of personal growth as well as making a contribution to a great cause. Facing the task of four months of endurance fitness walking, the team decided to use Nordic Walking poles. They saw the benefits of using the poles, especially to help with posture, engaging torso and arm muscles and reducing the compression through knees and hips over an extended training period. During the event, which was 90% off road, on some rather challenging tracks and trails, the team used the poles 100% of the time. The poles became affectionately known as 'crutches' towards the end of the challenge. Training during the heat and humidity of summer meant that foot care became paramount as feet blistered over the long training walks. Those team members who began to train exclusively in 'Thorlo' socks found that this problem was significantly reduced, only recurring when other socks were worn. Beattie Matheson, the suppliers of 'Thorlo' socks also are the people behind the 'Exel' brand Nordic Walking poles, which the team used during the event. The Grafton colleagues completed the challenge in 23½ hours and were one of the few teams that finished with all members intact. Their efforts raised more than $5,000.00 for Oxfam.